Would you rather have turret-press operators making and shaking out parts, or watching the presses sit idle while operators change-out tools? That’s the question that the production managers of job-shop metal fabricator T Top Mfg. had on their minds when they toured the FABTECH trade show in Las Vegas last fall. The company, which works out of a 55,000-sq.-ft. shop in Bridgeport, TX, found the answer to the rhetorical question when it spied on the FABTECH show floor new Campath TRM+ programming software from Murata Machinery, Charlotte, NC. The Motorum 2558 turret press at T Top Mfg. is equipped with a model F1G-1500 5- by 10-ft. automated load-unload system. The new machines Dugan speaks of are fueling the company’s rapid growth, from around 15 active customers 5 yr. ago to more than 75 customers today. The firm primarily fabricates aluminum (0.040 to ¼ in. thick) and stainless-steel (18 to 11 gauge) sheet and plate to supply customers in the oil-field, transportation and other industries. Company president Mark Tate started the business in a barn at his father’s dairy farm in 1997, moved to an 18,000-sq.-ft. shop in 2002, and moved to the current 55,000-sq.-ft. shop early in 2011. T Top employs 48 people, and in addition to CNC punching also performs waterjet cutting, CNC pipe bending and press-brake forming, sawing, welding and assembly. Coincident with its most recent address change, T Top acquired in September 2011 a Motorum 2558 turret press (from Murata Machinery) equipped with a model F1G-1500 5- by 10-ft. automated load-unload system. The press boasts a servo-motor drive system with 25-metric-ton punch capacity, a 44-station turret, bend-height capacity to 20 mm, and a maximum sheet size of 60 by 98.5 in. Then, late in 2012 the firm brought in a Murata Magnum-5000 Plasma punch-plasma machine, rated to 41 metric tons of punching force to tackle 10-mm plate as large as 5 by 10 ft. with one repositioning, 60 by 72 in. without repositioning. 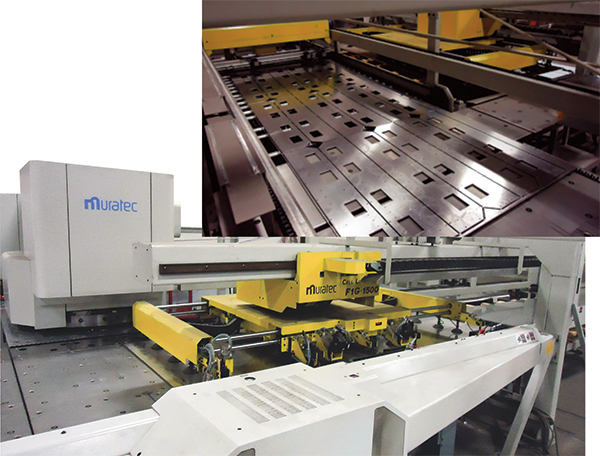 The machine also can contour-cut material—rather than using a nibbling tool—as it is equipped with a Hypertherm HT2000 plasma-cutting system rated from 40 to 200 A. 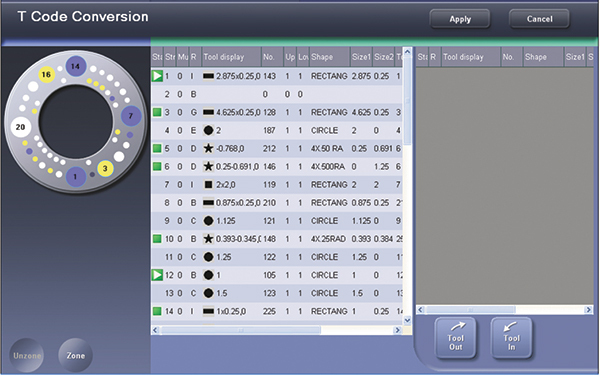 This screen shot shows the operator how, after running the T Code conversion routine, the TRM+ software has updated the program with the current tool locations in the turret. This avoids tool changes or requiring the operator to manually update the program. 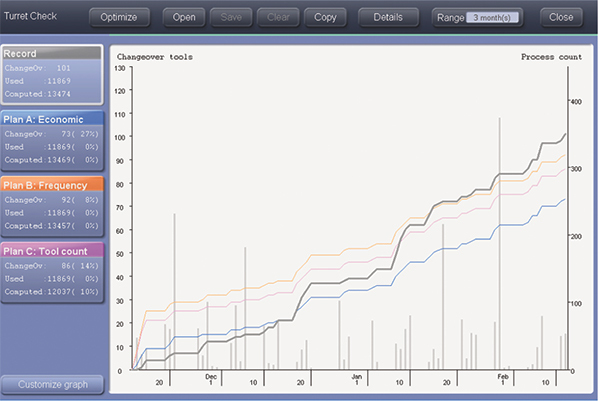 This TRM+ screen shot displays the results of T Top Mfg. updating its standard turret load based on several months of operation. Plan A provides a 27-percent decrease in tool changes. Now to the good stuff. Everybody likes to see and hear new equipment punching and forming parts, turning raw materials into profits—industry folks call this “the sound of money.” But behind the scenes, at T Tops and companies like it, oftentimes it’s the programming and scheduling software that really sets the tone. Specifically, the new Campath TRM+ software that has Dugan and his T Top coworkers beaming has “improved our throughput and productivity by 40 to 50 percent,” Dugan says. The software tracks the turret load so that as programs download to the press control, they automatically are updated with current tool locations. This means that as long as the required tools for a job already reside in the turret, operators need not move tools, or manually need to go into the program and rewrite the code. Wait, there’s more. Once a T Tops scheduler has loaded the press control with a day’s worth of programs, Campath TRM+ reviews the programs and sorts them based on material type and thickness, to minimize tool changes. Once a machine’s work load has been optimized by the software, the Motorum operator then can stack the day’s worth of material in the sheet loader in the order it’s needed, to facilitate untended operation. “The Motorum might run 15 to 20 jobs per shift,” says Dugan, “with each job consuming anywhere from one to five sheets; our lot sizes are small, 250 max. We can load four different sheet sizes in the loader; each day the press processes an average of 10 to 20 sheets. All we have to do is make sure we place paper interleaf between stacks of aluminum and steel to prevent contamination, and remove it when cycling through programs. “We also can override the schedule,” Dugan continues, “and prioritize programs, or put programs on hold.” Also found useful by Dugan and his coworkers is the ability of the software to track the number of hits made by each tool, “so we perform timelier tool maintenance—not too much, and not too little,” he says. And, programmers can use the software to simulate each programmed job to ensure proper sequencing, and make adjustments to the program to as needed before the job launches. See also: Muratec Murata Machinery USA, Inc., Hypertherm, Inc.